Now, time for us to break this skid before it becomes something worse. Oh, and the Gophers are in town. Varmints. 2-6 in the last eight games. Nine goals in four games. 10-3 aggregate last weekend in Grand Forks. The UMD Bulldogs are surely looking for whatever magic -- mojo, if you prefer -- they had going earlier in the season. Instead of cruising to home ice and perhaps a WCHA title, UMD is left to wonder what went wrong. Expect a jumbled line chart this weekend. Who knows what will happen in goal? No matter what, the mission is clear. UMD has to regain the mojo before the playoff start, or they face the reality of a quick exit. Hockey coaches have a reputation in general for being quick to panic and change everything. The reality is that no lines really ever stay together for an entire season. If you're so good that you can do that, you wouldn't have 12 losses in 32 games. Instead, chemistry wears out, guys get complacent, and you need to make changes once in a while to help your team find that ever-important spark. While the offense has been a problem for around a month now, the issues that cropped up in goal last weekend in Grand Forks are new. Yes, UMD's goaltending largely struggled against Bemidji State, but Kenny Reiter was outstanding in two games against Wisconsin and two against Michigan Tech. Very hard to blame anything bad that happened on him, because he was keeping UMD in a lot of those games. However, Reiter wasn't sharp against North Dakota, and neither was Brady Hjelle. Each had their moments, but struggled with their consistency, and both goalies gave up costly goals that could (and probably should) have been avoided. When looking for things UMD has to improve on this weekend, it starts with the goaltending, but it quickly transitions to the offense. They have to bear down in the offensive zone, get to the net, create havoc, and find the puck. It's easier said than done, but it's those second and third efforts that made this team so dangerous in January, and they have to get back to that. It's not an issue that easily goes away. That's why the lines were tinkered with this week, yielding what could be some very interesting combinations. If UMD revives the offense and gets the kind of solid goaltending they've had for something like 90 percent of the season, things will be just fine. If only one of those things returns, they can still win games. If neither of them back, the naysayers will have the last laugh. For a while now, the NASCAR Camping World Truck and Nationwide Series have dealt with the issue of start-and-park entries. A start-and-park is someone who simply qualifies for the race, runs a handful of laps or until the first caution, then slithers off the track with a mysterious engine, transmission, or other random problem. They park the car, collect the prize money for finishing 40th or so, then move on to the next venue. With economic problems and such, these lower series have faced the realities of start-and-park drivers by simply ignoring them. Yes, these are underfunded teams, but they would likely run the entire race if they could just find a sponsor for the car. Of course, the first major problem with this philosophy -- besides the fact that these people aren't racing to try to win races -- is that start-and-parks typically have to race their way into the field, meaning they likely bump out drivers and teams who intend to run the entire race. This issue has slowly crept into the Sprint Cup series, and may have come to a head last weekend, when struggling Prism Motorsports qualified two cars for the Auto Club 500, before pulling both off the racetrack. One of them -- Dave Blaney's No. 66 -- ended up in inspection. “Because they can,” said Bill Henderson, crew chief of the No. 66 team and general manager for Prism Motorsports. Henderson, who has just two cars for the team, was told the car will not be returned until next Saturday — long after qualifying is over. However, the primary car has the basics of racing — swaybar, shocks and springs — that the team simply can’t afford to duplicate on the backup car. Without those necessities, Henderson will not be able to race. This has led to a more open debate about the start-and-park teams. It's a debate that is long overdue. After all, it's more about the money than the racing. Prism got over $160,000 for its two-car, 83-lap cameo Sunday. That's more than Matt Kenseth got for a top ten finish (check the above link for more on this). Sorry, but NASCAR needs to do something. The smaller teams need a way to fund themselves and stay alive, but it shouldn't come at the sake of competition. Sprint Cup races are supposed to be 43 cars, and the overall event is hurt when multiple cars aren't trying to win, or even run all the laps. If a drug-out inspection process is what gets start-and-park teams to think twice, then NASCAR should look at doing it. Obviously, there is only so much that can be done, because engine failures and other catastrophic things happen, even to the top race teams. It just looks fishy when your engine or transmission crap out every weekend. One week after all the attention in the WCHA was on a near-fight that came after a real fight was broken up, all in response to an improperly-handled illegal hit from November, we can start paying attention to YouTubes of illegal hits again. Of course, these are the worst types of illegal hits. They're the kind that don't get called. A major emphasis in college hockey this season has been on hits to the head. You're supposed to see a virtually automatic penalty anytime a player hits an opponent square in the head. There have been a number of silly applications of this rule (including penalties on players who were merely trying to protect themselves and brace for a hit), but it's all in the name of player safety. Naturally, however, the ability of officials to consistently apply this mandate in such a fast-moving game has come into question. We take you first to Saturday's St. Cloud State-Wisconsin game, as Badger captain Blake Geoffrion -- usually on the other end of borderline or dirty hits -- ends up in a heap in the middle of the ice, courtesy of SCSU's Aaron Marvin. Yes, that Aaron Marvin. Obviously, officials Brad Shepherd, Todd Anderson, "Big" Brad Roethlisberger, and Mike Gulenchyn didn't see an illegal hit. They missed it. This is, by definition, an illegal hit. Maybe Marvin is guilty of nothing five years ago, though you'd like to think a dangerous hit that sees Marvin aim for Geoffrion's head would have been a penalty even before the sport started to wise up on things like this. Especially given that Marvin is developing a bit of a reputation for crossing the line in his physical play. This isn't meant to be a rip-job on the officials, but it's rather hard to believe that four guys in striped shirts could miss an illegal hit on the player who had the puck when he got hit. Also on Saturday, as North Dakota was completing their sweep of UMD, Bulldog sophomore Mike Connolly, who has been hit in the head this season without anything being called, was once again the victim of an illegal hit. You can't tell for sure on this video if Corban Knight of the Sioux hits him with an elbow, but Rink and Run's Kevin Pates reports that is the claim of the UMD coaches. Regardless of what part of Knight hit Connolly, it's obvious that something hit the winger in the head, as he has a concussion and a black eye from the hit. Officials C.J. Beaurline, Peter Friesema, Nathan Freeman, and Matt Ulwelling, like their colleagues in Madison, didn't see anything illegal and didn't call a penalty. In their defense, I was at the game and didn't see anything illegal from my chair, either. We'll see how touch the WCHA wants to be in this headshot mandate. No, penalties were not called on either hit, but at least the Marvin hit -- if not both -- deserve a serious look on video. The league hasn't been nearly tough enough on supplemental discipline this season, and if they don't start getting tough, none of this is going to stop. For a hockey fan, this is the most significant anniversary on the calendar. 30 years ago Monday, a group of college-aged kids pulled off the biggest upset in the history of sports. And that's not hyperbole or some sort of gimmick attached to a comparatively insignificant moment. If this doesn't give you goosebumps, nothing will. Actually, if that didn't work, here's Kurt Russell's awesome reenactment of Herb Brooks' pregame speech. Enjoy. GRAND FORKS, N.D. -- Even after a look at the tape, UMD's coaches are not wavering on last night's stance. This was a solid five-on-five effort marred by some poor play on special teams. It's something the Bulldogs look to remedy in Game 2 of the series tonight. GRAND FORKS, N.D. -- I'm sorry, but this arena is ridiculous. This is my fourth time here, and it just doesn't get old. There's always something, whether it be a decorative piece or something commemorating North Dakota's wonderful hockey history, that you haven't seen before or just don't remember looking at. It's the gold standard for college hockey buildings. Anyway, enough nice things about North Dakota. We're here to take four points. Emotionally Spent, or Galvanized and Motivated for Surge? GRAND FORKS, N.D. -- This the ultimate question surrounding this weekend's UMD-North Dakota men's hockey series. It's one that no one is remotely qualified to answer. In November, when UMD faced North Dakota at the DECC, the Sioux were still reeling from a November injury to All-American defenseman Chay Genoway. The injury -- a concussion -- was bad enough, but the circumstances -- a dirty hit from St. Cloud State forward Aaron Marvin -- made it even tougher to swallow. You can move on quickly when you watch a key player suffer a concussion in a freak accident or a clean hit. It's harder when you see him go down from a dirty, vicious, unnecessary hit, and you know you have to face that player and his team again later in the season. North Dakota went into a slump after Christmas, winning just one of seven games. It was a streak that started with a one-point weekend at Minnesota. The reeling Gophers had life, if only for a week or so. Last weekend, the slump continued. The seventh game in this painful stretch for UND was at St. Cloud State last Friday. The Huskies were outskated, outplayed, and badly outshot, but they somehow came out of the game with a 4-3 win. Once again, North Dakota played well, and they had nothing to show for it. They took out their frustrations in St. Cloud Saturday. A game that featured a near-fight and a third-period scrum ended up 8-1 in North Dakota's favor. The Sioux pumped in six goals in the second period, scored a total of five power-play markers, and chased a once-hot goalie in Mike Lee from the game. Afterwards, the Sioux talked about how important it was to get back in the win column, but also how important it was to take care of the Marvin storyline. So where does this leave North Dakota? This is a talented, mature, well-coached hockey team. As UMD comes to town, however, do they have more emotions in the tank to draw from? Did they spend it all getting a measure of revenge on Marvin? Was that the turning point, and the start of a huge run from a team very familiar with huge runs? UMD may find this out the hard way. Now, this won't be a Sioux-per weekend for UND without a little effort. The Bulldogs get energeting junior Kyle Schmidt back in the lineup. UMD's best even-strength goal-scorer has ten on the season, and the team clearly missed his spark while he was out. It's hard to explain, but Schmidt's dynamic speed and hockey smarts make his linemates better, and he's learned how to use his speed and play more consistently this season. This is a good place for Schmidt to return. It's the site of his first collegiate goal, back in November of 2007. That was UMD's last trip to Grand Forks, and it ended in a split. For the Bulldogs to clinch home ice, they have to bring the pain both nights, from the start to the finish. North Dakota will forecheck the daylights out of UMD, making it hard for their defensemen to move the puck up the rink. The forwards will have to be active in supporting their mates and limiting the effectiveness of the forecheck. Of course, the best way to beat a forecheck is to get the puck up the rink and create odd-man situations at the other end. Get a couple two-on-one chances, and suddenly UND may be a bit hesitant to throw the kitchen sink into the offensive zone. UMD is in a good position, despite a 2-4 record in their six games before the break. Now, they have to improve on that position and make this a truly special season. Via RWD comes this news on a former Bulldog defenseman. Fiona Quick of Minnesota Hockey Journal says Josh Meyers has signed a two-year, two-way deal with the Calgary Flames. He has ten points in 32 games so far for the Abbotsford (B.C.) Heat of the American Hockey League. That franchise took over this year as Calgary's primary AHL affiliate. Meyers played four years with the Bulldogs, rarely missing a game after a freak practice accident left him sidelined with a broken wrist during his freshman season. He finished his UMD career with 30 goals and 73 points, including ten goals and 28 points as a senior, when he served as a tri-captain with Andrew Carroll and Matt Greer. If the report ends up true, this deal makes good sense. It provides Meyers with the security of a multi-year deal, something graduated college players-turned-NHL free agents don't often get. It's a small investment for the Flames so they can see what Meyers can do. It also would signal that Meyers might not be that far away from getting a shot in the NHL. It's good to see such a growing number of former UMD players playing hockey professionally, both in North America and overseas. Kevin Pates' solid tracking of these athletes shows four former Bulldogs have seen time in the NHL this season. Matt Niskanen and Mason Raymond lead the way in experience at that level, with Raymond staring down the barrel of a multi-million dollar contract very soon, thanks to already having set career highs in goals, assists, and points. I know this is a taboo subject for the NCAA. They don't want anyone talking about the idea. However, it's time for them to take a good, long, hard look at the world we're living in. Hockey is different than it used to be. Players are generally bigger, faster, stronger, and even dirtier. As we learn more about hits to the head and the impact they can have on people who get hit high, player safety is more important than ever. Changing the strict rules on fighting certainly doesn't look like something that promotes better player safety. In fairness, though, the fact that the NCAA strictly prohibits fighting and automatically suspends players who fight doesn't help. There's a fine line between promoting fighting and banning it altogether, and college hockey would be wise to find that happy medium. After all, look at the downside to not having fighting in the college game. ... spoil over into this incident. You can blame Garrett Roe for diving around all you want, too. Roe is that kind of player, no matter what you may think of his scoring ability. It's totally understandable why he would be under the skin of opponents with his propensity for embellishment. However, Darcy Zajac was out of line, and the WCHA was probably wrong not to consider supplemental discipline for his actions. Anyway, perhaps this totally preventable sequence of events will give people a good idea why fighting in hockey is rarely a bad thing. As they did in the World Juniors, Team Canada's entry in the Olympic women's hockey tournament seems to enjoy rubbing their superiority in their opponents' faces. How did that turn out for Canada in the World Juniors again? Canada's women's team has won their first two games by a combined total of 28-1. They've outshot Slovakia and Switzerland by a combined 129-21. They beat Slovakia 18-0 in the opener Saturday, outshooting the outclassed opponents 21-3 in the third period, a period that started with Canada already leading 13-0. 21 shots in 20 minutes while leading 13-0? Really? Canada's players don't have much of a defense for this behavior, and it's obvious given how meekly they've tried so far. "I think it's just about getting something out of the game, and making sure we're playing together, and we're getting better each game we play," Apps said. "I think we respect our opponents absolutely, but as far as our team is concerned, in our locker room it's all about getting better each day and moving forward." How much better are you going to get by pistol-whipping a team that doesn't have a prayer against you? It's a dumb defense for a senseless tactic. Canada spent the third period of a 13-0 game TRYING TO SCORE GOALS. Meanwhile, Team USA pulled back on the throttle in the second period against China, a team that they didn't dominate quite as badly as Canada did Slovakia, preferring to play a puck-possession, cycling game in the offensive zone. Many of their shots were unscreened, with little traffic in front of the net because Team USA's players chose not to go there. To follow up 18-0, Canada showed it learned nothing by hanging five third-period goals on clearly-overmatched Switzerland Monday. If there were a way to disqualify a team for crappy sportsmanship, we'd boot the Canadians. Instead, we're just left to hope Team USA gives them what they have coming to them. A few weeks ago, while starting to get excited for Brewers baseball, the subject of pitching was brought up. It was mentioned that veteran free agent Mark Mulder, after battling injuries for a couple years, was looking at a return, and his team could be the Brewers. Mulder had either decided to retire, step away from baseball for a while, or he doesn't know what he's going to do. No matter the decision, it doesn't sound like he'll be a Brewer. Yet. "It's unbelievable. Where is it coming from?" he asked me with a chuckle. "I never said 'retirement.' That's the wrong word. The thing is, physically, I feel great, but my arm just doesn't work the way I want to work, so I just shut it down from throwing. But I never really said I was going to retire; I'm 32 and I don't feel like there's anything physically wrong with me." Several reports today indicated that Mulder was calling it a career, and Mulder's longtime teammate Eric Chavez told me and other media members that essentially the same thing. "He said he's done," Chavez told me this afternoon. "But he didn't really do a good job of convincing me. I said, 'You're not going to be the next Brett Favre are you?' "
Mulder said what it really amounts to is that he's stepping back for at least awhile. After two-plus years of surgery and rehab and visiting specialists and therapists, he has grown frustrated with the fact that even though he feels terrific, his left shoulder doesn't rotate exactly right, or that's how it feels. He told me he doesn't feel like he can get behind the ball properly when he's throwing out of a delivery, although everything is just fine when he's playing catch or doing long toss. The mechanics of the delivery are what are off, somehow, and he hasn't solved that puzzle despite consulting with everyone from motion experts to former coaches. Who knows about June, I guess? Mulder would have been a nice addition from a competition standpoint. However, he has to have looked at the Brewers' glut of starting pitchers and wondered where he would fit in, even if he were healthy. Unfortunately for Brewer fans, no Mulder increases the likelihood of Jeff "Money Eater" Suppan hanging around. Suppan is in his contract year, assuming the Brewers don't pick up his option (why would they?). Hopefully, he finds a way to locate pitches better than he did in 2009, and he can be a somewhat-valuable player for the team. The good thing about Mulder not showing up is that there is no threat of the Brewers having four lefties in the starting rotation. Given the number of right-handed hitters in the NL Central, too many lefties could actually be a bad thing. The UMD men's hockey team has a number of goals this season. However, one of those goals cannot be met without another. They're sort of married in a way. Earn home-ice advantage in the first round of the league playoffs. UMD is very close to accomplishing this feat, giving the home fans playoff hockey for the first time in six seasons. Heading into this weekend's two-game series at North Dakota, the Bulldogs have an eight-point lead over the sixth-place Fighting Sioux. Each team has six league games left, for a total of 12 available points. That means UMD's "magic number" for home-ice advantage in the WCHA playoffs is six points. Any combination of six points accumulated by UMD or lost by North Dakota will give the Bulldogs a coveted home-ice position. This could happen this weekend. UMD getting a win and a tie in Grand Forks would give them a ten-point lead on the Sioux with four games to go. It would be impossible for North Dakota to catch UMD, as they could only pick up eight points over the rest of the season. If the Bulldogs just get a split, they would only need one win or two ties in their last four games to clinch home ice. It's not time to buy your playoff tickets yet, UMD fans, but we're getting real close. While it will be tough -- if not virtually impossible -- to win the league given the remaining schedules of the contending teams, the Bulldogs are in a good position to play at the DECC the weekend of March 12-13. Not only that, but they're still in a good position to finish third or better, which would guarantee that the Bulldogs will avoid the play-in game at the Final Five, should they advance that far. These are attainable goals, as is everything else at this point. Not many teams can say this, so UMD fans should take heart and enjoy the stretch run. There are two sides to the extremes of emotion. The first is the jubilation. The raw, seemingly unending happiness that comes with the greatest of accomplishments. 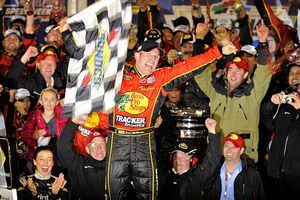 For NASCAR driver Jamie McMurray, the lifelong dream came true Sunday evening at Daytona. McMurray, a driver who was out of a job for a time last fall, won the Daytona 500 in his first points race for new employer Earnhardt Ganassi Racing. McMurray was a victim of the numbers game at Roush Fenway a year ago. He lost his ride because of a mandated downsizing of the Sprint Cup racing team, combined with numbers that showed him woefully short in the wins department. With his new ride, the No. 1 Bass Pro Shops Chevrolet, McMurray didn't take long to prove himself. If these plate races are like entering a random drawing, McMurray was the lucky winner Sunday. You'd be hard-pressed to find someone more grateful for his opportunity. There is a flip side to this emotion, though. It's the feeling of losing someone you're immeasurably close to. For Brian Burke, this feeling became a reality nearly two weeks ago, when he got word that his son, Brendan, had been killed in a car accident while driving on a snowy road in Indiana. Brendan had been visiting Michigan State University, and was on his way back to his home base of Oxford, Ohio, where he attended Miami University and worked as a student manager on the men's hockey team. For Brian Burke, a normally gruff and unemotional man in front of the camera, Sunday brought a whole new challenge. While he tried to put on a strong face for his U.S. Olympic men's hockey team -- he is the general manager of the team -- it's clear Burke is still hurting. The hurt is evidenced by a great column from FanHouse colleague Lisa Olson, who spoke to Burke after his press conference in Vancouver. "He was born with a lot of lucky signs around him," Burke said. "Just a magnetic personality even as a kid." At Brendan's wake in Canton, Massachusetts, amongst the hundreds of mourners, Burke ran into one of his son's teachers. Everyone had their favorite story about Brendan; he had impacted so many people in so many different ways, and it warmed Burke's heart to hear them all. This teacher told him about an eighth grade dance, and a girl standing alone in the corner. Brendan walked over and asked her to dance, oblivious to (or maybe in spite of) his classmates' snickers. "He didn't care what they thought, he just didn't want her to have a bad night," Burke said, beaming like a father boasting about a son who had won several Stanley Cups. People wonder why we love our sports so much. A big part of sports should serve as an escape. Even those who can't escape reality sometimes need a temporary release. 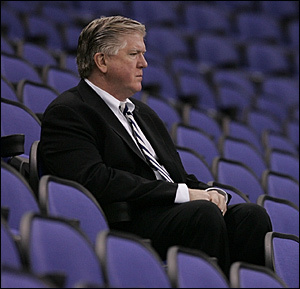 For Brian Burke, here's hoping the next two weeks are an opportunity for him to enjoy the fruits of his labor. He worked hard to build this U.S. team, and they have a chance to reward him with a medal. If that happens, it will surely be another in a long line of emotional days for a man once viewed as being without emotions. Shows what you get for judging a book by its cover. For some reason, this rubbed me the wrong way Friday morning. 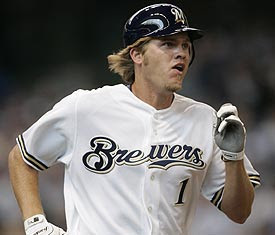 Milwaukee Brewers outfielder Corey Hart, by all accounts a pretty decent guy, and probably best known for letting his daughter get beer dumped on her after he was named to the 2008 All-Star Game, took his team to an arbitration hearing this week. This is not a crime, and no one is looking down on Hart for fighting for the salary he feels he deserves. Yes, it's Monopoly money, but they have a right to get what they feel they have coming to them. Last year, Hart was terrible. His average slipped, he couldn't hit consistently, he didn't generate much power, had a poor year of run production, and was injured for a time. Despite the fact that arby hearings usually boil down to comparable players and not so much individual performance in a single season, it made sense that Hart would fail to win his arbitration hearing. Give both sides credit. You figured the Brewers wouldn't have any hard feelings about the deal, but Hart was extremely classy in victory. When told there was some fan backlash over his big raise from a $3.25 million salary after an off year, Hart said, "That's just one of those things you have to deal with. I didn't have a good year last year. I'm sure they don't think I deserved a big raise. "I've just got to win them back over. I always play hard. I'll try to put up good numbers and get them back on my side." Asked if the big salary puts more pressure on him, Hart said, "I don't look at it as pressure. I always want to do my best. I want to prove that I'm a better player than I showed last year. I want to be a big part of this team and do everything I can to help us win." While it irked many Brewer fans that Hart sought such a big raise, it's heartening that he seems to understand why that is. If Hart follows through on his pledge to prove that he's a better player than the .260/.335/.418 he put up last year, he could be in for a huge 2010. If that happens, he probably won't have to worry about his salary for a while. You'll notice a new widget on the upper left. It's temporary, and it will keep you posted on the latest news surrounding Olympic hockey. The Games start Friday, with the men's hockey tournament set to start Tuesday. On the bright side, I won't miss the current guy when he's gone, either. I also don't think he's all that and a bag of chips. So it's really not personal, Dubya. I picked up my trusty Sporting News College Basketball Preview about a month before the season started. It's always fun to see where the "experts" pick the top teams to finish, and it's also fun to try to find the potential surprise teams in the power conferences. I was a bit surprised when I read about the Big Ten, because I kept reading through the predicted order of finish, and I wasn't seeing Wisconsin in the top four. Or top five. Or top six. Or top seven. Looked at the capsule, and nothing happened that I hadn't heard about. Bo Ryan was still the coach. Could people in the know really be counting the wizard down for the count? Apparently. Ryan will have none of your doubts. He might be one of the more disliked opposing coaches in the Big Ten, but he's also one of the best. If not the best. 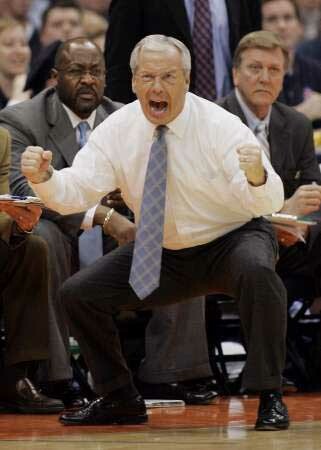 Hell, he might be the best coach in the country. While Roy Williams is floundering with highly-touted future NBA stars, Ryan continues to plug away with a future pro or two, but otherwise a fundamentally-sound, smart basketball team that wins games. The job Ryan has done this season might be among the best he could ever pull off. Under the weight of virtually no expectations, Wisconsin started off a little inconsistent. The Badgers beat Duke, which was wonderful, and their win over Maryland in Maui looks more and more impressive every week. However, Wisconsin also managed to lose at Wisconsin-Green Bay. No one really knew what they would do in Big Ten play. Then junior forward and leading scorer/rebounder Jon Leuer broke his wrist in a win over Purdue. That only added to the questions. No problem, Ryan says. Instead of panicking, the Badgers are playing well without Leuer, and they're small-balling people to death. "They’ve gone to ‘small ball’ with three guards," said Illinois coach Bruce Weber, and he might have added that they sometimes go with four. ... "(Jordan) Taylor has been getting major minutes since Leuer was hurt, and this three-game lineup is hard to deal with," Weber said. "Trevon Hughes is playing exceptionally well as a senior. And Jason Bohannon, who came in as a catch-and-shoot guard, is now scoring on pull-ups and fades. All three of their guards can dribble and create. We have limitations on our team in that regard. "You wonder if they might get hurt defensively but they pack in and compensate for their lack of size." The Badgers are one of the best defensive teams in the country. They shoot well from the outside. Once Leuer is back, they'll be able to compete more effectively on the boards. It has some talking about Wisconsin being a potential Final Four team. While that hype is a bit strong for this early in the season, it's worth noting that Leuer should return in time for the Big Ten Tournament, which should give him one or two games before the NCAAs (no more than three, given Wisconsin's current standing in the league). What remains to be seen is if Leuer's return actually sends Wisconsin into some odd Ewing Theory-triggered fall. Maybe they have gotten to the point where the return of even another inside presence could actually hurt their rhythm. Don't bet on it with Ryan. Rush The Court says it best. Throw Bo Ryan’s name in there along with Jim Boeheim, John Calipari and Steve Alford for National Coach of the Year. 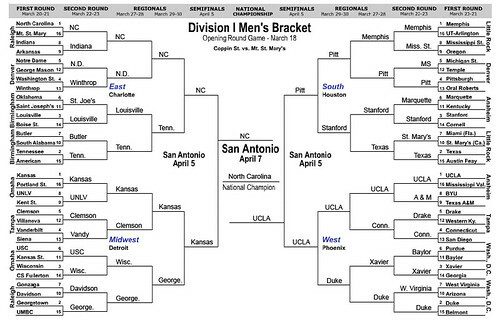 We all know Boeheim or Calipari will win. They're high-profile, needle-moving coaches having stupendous seasons with high-profile, needle-moving programs. Perfect combination for hardware. Unless you're Brent Musberger, you're not moved by Wisconsin as a member of the voting public for these major awards. You probably don't know that Bo Ryan is 211-78 (.730) as Wisconsin's head coach. You wouldn't know Jon Leuer from Jon Heder. You should, though. Ryan is the guy who will always be behind a contender. It's not because he changes teams like crazy, and it's not because he always has top recruits as his disposal. It's because he coaches his tail off, understands the game as well as virtually anyone, and puts his players in a system where they can succeed against virtually anyone. Simply put, Ryan's had a hardware-winning kind of season, whether he wins it or not. He's proven himself as an elite coach in college basketball, and the best of this particular Wisconsin team may be yet to come. Only twice in the last 21 years has a defending NCAA hoops champion failed to make the field of 64/65/whatever the next season. One of those (Kansas in 1989) was ineligible for the tournament because of probation. This year, North Carolina is perfectly eligible for the event, but there's a really good chance they won't qualify. The Tar Heels are near the bottom of the ACC entering the week, and there appears to be little hope for a quick turnaround. Even if the play gets better, UNC may have already done irreparable damage to their NCAA chances. Their RPI sits at No. 79. As noted by ESPN, that places them below such luminaries as Sam Houston State and Louisiana Tech. For North Carolina coach Roy Williams, who has been nothing short of awesome in his tenure as a head coach in this sport, confusion reigns supreme. Yes, we figured Carolina would be down a bit from last year's overwhelming high, but we didn't think it would be anything at all like this. "In 21 years as a head coach, I've never been in this spot," UNC coach Roy Williams told reporters in College Park, Md., on Sunday. "Somewhere, somehow, I've got to help the kids get out of it. But 2-6 is not comfortable. It's not good." Oh, and rival Duke comes to town Wednesday, part of ESPN's well-timed Rivalry Week. With only North Carolina State and Miami keeping them from the ACC cellar, and noted ESPN bracket expert Joe Lunardi not even listing North Carolina among the top eight teams out of his field, this is more than just an uphill battle UNC is left to fight. I've seen UNC a few times, including their riveting second half comeback at home against Georgia Tech. Yes, it's a game they lost, but the Heels were hopelessly behind, went on an amazing run, and actually made Tech sweat quite a bit to get the narrow win. While they didn't get the "W" on that day, it looked as if they could recover quickly and stay in the ACC race. Since then, they've lost four of five, and three of those were by double digits. Even if the Tar Heels can beat Duke twice, it's hard to imagine them doing any better than 5-3 over their last eight games. That places them at 7-9 in the ACC, 18-13 overall as the league tournament starts. Yes, this is North Carolina, but they aren't going to magically jump into the list of top 40 at-large candidates. They would still need to win the ACC Tournament to get in. While it sounds weird to say, it might be time to seriously consider the reality of an NCAA Tournament without North Carolina. And, no, you can't blame this one on Bill Guthridge or Matt Doherty. There has been a lot of chatter lately about the future of the NCAA Men's Basketball Championship. The 64-team field became a field of 65 a few years back, as a 31st conference became eligible for an automatic bid. The idea of expanding the tournament has been an open topic for a number of years, with advocates existing to take the field to 96 or 128 teams. Back in the days of the old radio show, I advocated an expansion to 96 teams, because I was intrigued by the idea of awarding first-round byes to teams. Shockingly, the idea of a 96-team tournament isn't sitting well with some. Take Jim Delaney, commissioner of the Big Ten Conference, who spoke with Sporting News Today in Monday's edition. "I don’t know about threatening the popularity of the tournament as much as having more dilution of the regular season. I do think the tournament is elegant in the way that it’s structured, but I’m more concerned about, 'What does this mean for the sport of basketball from November through March?' I don’t think it would make the tournament less popular. It would affect it in some ways. There’d be different kinds of competition in the first and second round." Delaney's right on one point. This change would not make the tournament less popular. However, the argument about the sanctity of the regular season doesn't hold water. Out of the 31 conferences that play Division I basketball and have an automatic bid to the NCAA Tournament, close 20 of them will be one-bid leagues in any given year. Only one of those conferences -- the Ivy League -- does not use a postseason tournament to determine its automatic bid. For these leagues, the regular season is completely pointless. A team could go 16-0 in league play, winning by an average of 25 points, and they would still miss the NCAAs if they didn't win the three-day league tournament. Now, the commissioner of a power conference that makes a ton of money on its postseason tournament -- a tournament that is also used to give out the league's automatic NCAA bid -- wants you to believe that the regular season matters in the sport. The addition of 32 teams creates a few problems. For starters, and this is going to sound ridiculous, the normal one-sheet bracket would die, and you have no idea what this could do to overall interest in the tournament. No one does, because the impact this has on office pools could be an issue. Who gets the byes? The top 32 seeds? How about rewarding teams for actually trying to win their conference tournament by awarding an automatic bye to any team that wins its regular season and tournament championships? There it is: Real incentive for a team to give it their all in their league tournament. Makes the quality of basketball in them much better. Downside does exist here. There will be pushback from traditionalists, but the traditional 64-team field is no more. It will go to at least 66 by 2020, when the Great West Conference qualifies for an automatic bid for the first time. Traditionalists have a point, because the old field of 64 was special, but 64 is gone, and it's never coming back. What's the harm of finishing the expansion to a point where they won't have to do anything again (unless they want to)? 128 levels the playing field, but can you imagine the craziness of 64 first-round games? Not only that, but if you want to restore some sort of value to the regular season, is there a better way at this point than giving teams that are really good from start to finish a chance to earn a first-round bye? The NCAA has some tough decisions to make, both with the size of the tournament and the broadcast outlet that wins the television rights. Hopefully, they aren't bogged down by bureaucratic BS, and they can make sane decisions that will help grow the scope of the championship, while also keeping in play many of the traditions that make it special. The NASCAR season opens for real this week, as Speedweeks hit a fever pitch at Daytona. The Sprint Cup drivers hit the track Thursday for the Duel races, which will determine the final starting grid for the Daytona 500 Sunday. They also serve as a last chance of sorts for the drivers who have yet to qualify for the race on speed. They are absolutely not the focal point of any media attention in Daytona. Instead, the Super Bowl of stock car racing is taking a backseat to the Go Daddy sideshow known as Danica Patrick. With all due respect, Danica drove well in Saturday's ARCA series race at Daytona. She belongs in a stock car, and she will likely develop into a good NASCAR driver. In that respect, she is not a sideshow. None of what you're going to see at Daytona is a good thing. She isn't asking for the overwhelming attention she will get, and there's a good chance she'll be embarrassed by some of it. However, the media has jumped on this like they jump on Brett Favre, Alex Rodriguez, and other needle-moving sports figures. They're all-in. That means it will be a sideshow, unless Danica wins, which is extremely unlikely. That said, anything can happen in a plate race. Patrick has announced she will run the No. 7 GoDaddy.com Chevrolet for JR Motorsports Saturday, as the NASCAR Nationwide Series kicks off its 2010 season at Daytona. It's not a mistake because she's taking attention away from the race. She's going to do that in every race she runs. It's not a mistake because she appears to be -- at least for one race -- taking a ride away from Kelly Bires, who was signed to JR Motorsports to replace Brad Keselowski (now with Penske Racing). Bires was scheduled to run the full Nationwide schedule, but now will miss the first race because the other JR car is being run by team owner Dale Earnhardt, Jr. It's a mistake because Danica doesn't need to expose herself to this spotlight so early in her stock-car racing career. The season-opening race is a big deal for everyone, from drivers to crew members to media. Because it's such a big deal, a ton of Sprint Cup drivers will run the Nationwide race to maximize sponsor dollars for their owners. The same kind of spotlight isn't on the Week 2 race at California. The entry list will be less cluttered with Sprint Cup names, and Patrick would have her chance to get her feet wet against competition less hungry for a win. It's more the kind of race she'll see in her other Nationwide Series starts, and it's a better race for her to start with. Daytona, with its high banks, high speeds, and high tempers, is not a good place to give a rookie her first outing. Perhaps she will drive the wheels off the car, impress everyone, and score a finish higher than anyone expects. But the potential for her to be involved -- directly or indirectly -- in the kinds of incidents she doesn't need to get into is too high. For my taste, it's just too risky to send the rookie out for this race. JR Motorsports could have and should have convinced Patrick to wait for California to make her debut. There, she could have run a solid race, won the respect of her peers, and learned the give-and-take of stock-car racing at that level. Instead, she's going right into the fire, and it isn't the kind of risk anyone should be taking. As odd as it is to write, the New Orleans Saints are Super Bowl champions. It wasn't a fluke, either. The Saints fell behind 10-0, but it was almost like a rope-a-dope maneuver. From that point, New Orleans owned the show, outscoring Indianapolis 31-7 and clearly establishing themselves as the better-prepared team, along with being the better team. There are many ways to emerge victorious in a one-game playoff. It's part of why playoffs are a bit of a misnomer when it comes to determining the best team in a given sport. However, there is no questioning a team that dominated virtually from start to finish, and then beat three future Hall of Fame quarterbacks in very different ways to win a championship. (Think about it. The Saints jumped all over Kurt Warner and the Cardinals, running up points like crazy and then coasting through most of the second half. They practically broke Brett Favre in half in the NFC title game. While they didn't hit Peyton Manning much, they rattled the hell out of him mentally and confused him like he hasn't been confused in a long time. Yes, I know I picked Indianapolis. If I had it to do over again, I'd pick the Colts, too. Not to pat myself on the back, but at least I got part of the equation right. Turnovers. Special teams. Fundamentals. These things don't always decide games. But they're usually a good starting point. And they're terribly hard to predict. ... it's so hard to say that one team or the other will win the battle of "little things" in a game like this. The Saints won the battle. I had a feeling before the game that something like this would happen. Sean Payton made clear his message to his team throughout the week, and he made clear during meetings with the CBS broadcasters that he would not let his team get caught playing passive, not-to-lose football. They were going to be the aggressors, and in doing so, the Saints made up a new blueprint for success in the NFL. New Orleans treated this like a hockey game, really. They wanted to initiate from the start, but they also knew they weren't going to bash Manning around like they did to Favre. Instead of initiating a physical assault on Manning, they initiated a mental one. Read Dan Graziano, FanHouse colleague, on the Saints' plan. You have to go back to Monday, Jan. 25, the day after the Saints beat the Vikings to claim the NFC title. In a meeting with his coaches, Saints head coach Sean Payton was discussing the idea that they would do well to encourage the Colts to run. "You guys can't be upset," Payton said to defensive coordinator Gregg Williams, "if they have 100 yards rushing." Williams, who agreed with the sentiment, went a little harder. "We can't be upset if they have 200 yards rushing," Williams said. So a couple of days later, Payton addressed the defense in a team meeting and hedged. "You guys can't be upset if they get 150 yards rushing," he said. So a multi-faceted game plan developed, and one of its key facets was a shift to a 3-4 alignment for the first quarter so the Saints could cover the Colts' receivers deep and invite them to run the ball up the middle. "We tried to invite them to run as much as they would do it," Williams said late Sunday night, when it was all over. The Colts did. They racked up 66 rushing yards in the first quarter and raced out to a 10-0 lead that might have had Saints fans panicked but was pretty much along the lines of what Williams had been expecting. As long as the score didn't get out of hand, he knew he could stick with the amoeba game plan, which called for a switch back to a 4-3 alignment for the second quarter and then a ton of shifting looks in the second half. "You can't beat Peyton Manning if you don't keep changing what he's looking at," Williams said. That last quote is the money shot from this game. You can read 3,000 more words on the Super Bowl, and none of them will be as significant as those 14. Finally, someone had the guts to change defensive looks, possibly allowing themselves to be singed for a time, because they knew they couldn't afford to get into a pattern. I'm not about to say that this is the downfall of the Colts or of Manning. He's an elite quarterback, and he will be enshrined in Canton someday. He will have more chances to win rings, and he will likely hoist the Lombardi Trophy again. But he met his match -- for at least one night -- in Williams. He met his match with an opponent who refused to sit back and play passively, allowing Manning to dictate matchups and tempo for four quarters. He met his match with an opponent who refused to allow Manning to adjust, because Williams was prepared to be the initiator in the mental game during the second half. Payton, however, gets the award for aggression. It's one thing to see a hole in a team's kick return game that can be attacked by an onside kick. It's another to 1) have enough faith in your kicker (who had never tried an onside kick), 2) have enough faith in a defense that was beaten regularly in the first half to make a stop if necessary, and 3) have the guts to make the brashest Super Bowl play call in years. The guts of Payton, the confidence and swagger of Williams, and the talent of guys like Brees, Tracy Porter, and -- yes -- Thomas Morstead made this team unbeatable on this night. Even for a guy like Manning, who is used to having nights like this go his way. This time, Manning found an opponent who refused to let him win, no matter what he could have tried. Let's see how many teams follow the blueprint, because it's not a popular path to choose. NFL teams aren't known for ruthless aggression from a standpoint of strategery. They prefer to do what everyone else does, and play this bland, conservative style of football, hoping the other teams screws up. Since guys like Manning rarely screw up, teams who play the Colts conservatively are ripe for the picking. But the Saints clearly saw things on film in the AFC title game, when the Jets bottled the Colts up until the two-minute warning of the first half. Where the Jets went wrong, though, is that they had no answer once Manning figured them out. They didn't have anything to throw at him, because he had seen it all and had a way to beat it. Williams, as noted by Graziano, knew going in that they had to be constantly changing looks, the way the Saints do on offense. By turning his defense into an offense, Williams held the key to a Super Bowl win for a franchise -- and a city -- that will revere it like no other. HOUGHTON, Mich. -- The only thing good about Friday's loss to Michigan Tech is that I can stop the stupid musical interludes, because they clearly weren't destined to work for long. Now, time to break this 1-4 slide. And, no, it won't be much better if it becomes a 2-4 stretch. But 2-4 is a helluva lot better than 1-5 if you look at it that way. So go win, boys. There aren't many things in the world harder than penning a Super Bowl preview and coming up with something original. After two weeks of storylines, press conferences, hype, overhype, and more overhype, the game is Sunday in Miami. Instead of sitting here talking about things you've already read about, let's try to keep it relatively simple. The little things are always important in a football game. These things don't always decide games. But they're usually a good starting point. And they're terribly hard to predict. The Green Bay Packers were plus-28 in turnover ratio this season. They lost their only playoff game this year -- at Arizona -- largely because they were minus-two in the game. Who could have seen that coming? The Chicago Bears had an game-opening kickoff return touchdown by Devin Hester in the Super Bowl three years ago. They were then thoroughly dominated by Indianapolis and lost 29-17, despite making the only truly significant special teams play of the game. Whoda thunk that Kurt Warner -- future Hall of Famer -- would throw the dumb, dumb, dumb, dumb pass he threw to James Harrison that turned Super Bowl XLIII on its ear before halftime? Warner knew better, and he threw it anyway, costing his team points and causing a huge shift in momentum before halftime. These things happen in playoff football games, and it's so hard to say that one team or the other will win the battle of "little things" in a game like this. Myth: Quarterbacks decide this game. What if they don't? What if the defenses pick up their play and change the way it's played? You're telling me you don't think Gregg Williams can pull a rabbit out of his hat and at least slow Peyton Manning down long enough to make him think a bit? Same for the Colts and Drew Brees. It's crazy to think a defense that stiffened like it did during the AFC Championship could be helpless against an offense that has been notorious for slow starts on the road (Miami and Washington this season come to mind). Oh, and Brees didn't exactly light up the Vikings, especially in the second half, when they were held under 100 yards. It's just as likely that guys like Joseph Addai, Donald Brown, Pierre Thomas, and Reggie Bush will have a huge say in how the game plays out. No need to oversimplify things. Brees and Manning are big-time quarterbacks, and the offenses are both keyed by the passing game. Both teams, however, have proven they can run the ball, and one-dimensional offense isn't likely to win the game. The game is better with the week off. Having watched a couple Super Bowls where the teams didn't have an off week ahead of it, I believe pretty strongly that the overall quality of play is better when you have that extra week. Most teams will build their game plan at home during the bye week, then fly to the game site Sunday or Monday before the game. Practices happen in the host area, but neither team is doing a ton to tip their hand, because each team has a pool reporter assigned to their workouts (closed to the public). The game plan has been in place, everyone knows what is going to happen, and it's all about mental preparation and blocking out all the distractions for the game. When you don't have the off week, you accelerate everything. In some respects, it could be a better game if you don't give coaches an extra week to overthink everything. Without the extra week, coaches are more inclined to do what got them to the Super Bowl, instead of trying to re-invent the wheel. But you need the right coaches and players to make the short week work. With media obligations, family and friends begging for tickets, and having to get to the host city early in the week, there is a lot going on outside of the preparation. For many teams, it's proven to be too much to deal with in recent years. Stick with the week off, NFL. The quality of the game is more important than the oversaturation of coverage that is produced when you have the off week. The Colts are the better all-around team and will win. It busts me up, because I want the Saints to win. But Bill Simmons probably said it best. How dumb will you feel in the fourth quarter, with the Colts leading by 10 and driving for another score, if Manning has the New Peyton Manning Face going? Would you be kicking yourself? Would you be saying, "Why did I go against Manning? What was I thinking?" Let's not be That Guy. Manning is better than Brees. Reggie Wayne, Pierre Garcon, Austin Collie, and Dallas Clark are better than Devery Henderson, Marques Colston, Robert Meachem, and Jeremy Shockey. The Colts are better on defense, even if Dwight Freeney is limited or sidelined. Oh, and Manning is better than anyone on the field for either team. If you're in doubt about a game, you look at who has the better players. You have to love the story of the New Orleans Saints, but how can you argue they have better players? That's insane, and it's wrong. HOUGHTON, Mich. -- The Bulldogs enter Houghton on a bizarre winning streak of sorts. UMD has won four straight WCHA road games dating back to a Nov. 21 win over Minnesota at Mariucci Arena. 1. UMD has experienced plenty of struggles to win in both venues in recent years (Minnesota, Minnesota State). 2. UMD has only played four WCHA road games in a span of more than two months. Six of the last eight are on the road, so if UMD is to earn home-ice advantage in the first round of the WCHA playoffs, they'll have to do it by getting points on the road. Since the lame musical interlude worked last weekend, here it is again. Motivation is a difficult thing to predict. With that being said, it's virtually certain that a nationally-ranked team will struggle to get motivated for games against a last-place bunch. The task is even tougher in a dead building. If there isn't atmosphere and energy in the building, a team can be more prone to playing to the level of its competition. 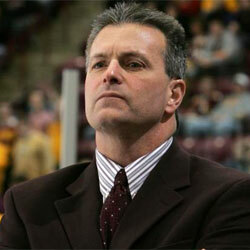 For UMD, there shouldn't be as many issues as usual during their annual trip to Houghton, Mich. Yes, Michigan Tech is in last place in the WCHA. A 4-1 win Friday over Minnesota State broke a string of 15 straight games without a win (0-14-1). They have less than half as many goals (54) as their opponents (110). The penalty kill is hitting at under 70 percent for the season. No sugarcoating here. The Huskies have had an awful season. There have been rumblings in the U.P. about the future of head coach Jamie Russell. In a town that small, there are more than a few unkind things that have been said and easily gotten back to Russell, who is a good guy and a good hockey coach. He just happens to be in a nearly-impossible situation at Michigan Tech, especially when his team is beset by injuries and can't play their normal in-your-face style that got them to a Final Five not too many years ago. However, this weekend is different. There won't be 2,000 people milling around the MacInnes Student Ice Arena. Instead, the building will be packed, and there will be an atmosphere unlike any other weekend in Houghton. There will be huge crowds, a loud building, and people having a ton of fun. The games are part of a huge weekend celebrating the winter and the immense amount of snow they get in Houghton. Snow sculptures have been under construction on campus for a few weeks now, and they will be in full view all over this weekend. Hotels 50 miles away are booked solid. When it comes to comparing this to something people are more familiar with, the best we can muster is a football homecoming weekend in the fall. It's very similar, only the setting is snowier and involves hockey instead of football. Alumni come back from all around, and it's a proud weekend for the people of Houghton. Oh, and Michigan Tech is always tough during Winter Carnival. Just ask any of the last five teams who have visited for Carnival Weekend, because none of them have left with four points, regardless of how bad Michigan Tech has been. 2004 was the last time Tech was swept during Winter Carnival. Overall, UMD has been there five times before, posting a record of 3-6-1. Michigan Tech is well over .500 all-time in Winter Carnival games. As you can see, this won't be easy. It becomes especially difficult if the Bulldogs can't cash in on opportunities. In November, UMD lost a game to Tech despite outshooting them by a more than 2-1 margin. Letting Tech hang around a game is a recipe for disaster, especially when they're amped up by a full and loud home building, something entirely too rare for them in recent years. On the ice, UMD has to shut down the duo of Malcolm Gwilliam and Superior native Brett Olson, who will burn you if you let them. Jack Connolly and Mike Connolly played well Saturday with new linemate David Grun, and he brings them an edge that allows them to gain more space to make plays. Even better, it seemed Justin Fontaine only made an effective line of Drew Akins and Jordan Fulton better. On paper, the Bulldogs have too much firepower for Michigan Tech. By a lot. The key will be focus and determination for 60 minutes both games. It's easier said than done when playing a four-win team, but being able to pull it off is a big difference between contenders and pretenders. Just because Michigan Tech is always a tough out during this particular weekend doesn't mean it's okay to give them points. I don't get into Signing Day. It's hard to muster much enthusiasm for the college decisions made by teenagers who I have never seen play. However, I do always (I think) post on here when UMD signs a recruiting class. The Bulldogs announced 18 football signees on Wednesday, and while none of them will make the kind of waves Seantrel Henderson made by deciding on USC, these kids will get the chance to help the Bulldogs build on a pretty strong foundation. UMD won the Division II national title in 2008, then made the quarterfinals in 2009 before losing to eventual NCAA runner-up Grand Valley State (Mich.). A talent-laden group of 18 student-athletes, including a pair of local high school standouts, have signed national letters of intent to attend and play football for the the two-time defending Northern Sun Intercollegiate Conference champion University of Minnesota Duluth in 2010. "All and all, we are extremely pleased with this recruiting class -- it's a high-quality and promising group of athletes," said Bob Nielson, the 2008 D2football.com national coach of the year who completed his seventh season with the Bulldogs last fall. "I think our coaching staff once again did a tremendous job in identifying and addressing our future needs on offense, defense and special teams. We were successful in bringing the kids we had targeted at each of the various positions and that's a testament to all of the hard work our staff put into our recruiting efforts." UMD closed out its 77th season of intercollegiate football with an 11-2 overall record and made its second straight NCAA Division II playoff appearance (and third in five years) before bowing out to Grand Valley State University in the quarterfinal round. The 2008 national champion Bulldogs also laid claim to their second NSIC crown in as many years with a perfect 10-0 mark and, along the way, established 21 individual and team single-game, single-season and career marks while producing three All-Americans. UMD has always done well with local recruits, and while they didn't get everyone this year, the two they got should be good. Esala was a rock on the Oredockers' offensive front, and he could have a chance to play as a freshman because of his big frame. Miesbauer starred at Northwestern, and was a big key to the quick turnaround that program experienced over the last two years. The Tigers went from a 1-8 season in 2007 to the Wisconsin Division 4 semifinals in 2009. Miesbauer might not carry the ball as much at UMD, but he is a good athlete for his size and will only get better as a fullback with the experience he will get as a Bulldog. As you may have heard, Sunday is the Super Bowl. As the Colts and Saints prepare to lock horns, fans are left to marvel at the sight of No. 1 seeds advancing out of the respective conferences. It doesn't happen often. Parity in sports is a hot-button subject. In the NFL, the objective these days is more to just get in the playoffs than it is to have a 14-2 season. Other sports, while still leaning toward the favorites, have had their moments. Of course, it helps that other pro sports feature best-of-seven series in the playoffs. The format tends to tilt in favor of the superior team, since it's pretty hard to be an inferior team and win four of seven games. If you do, it's probably because you deserve it, no matter your status in the regular season. After all, you just won four out of seven (or fewer) games against a good team. It's not a one-and-done fluke. It's more of the real deal. For the NFL, a study confirms what most of us have known for many, many years. The best team doesn't always win. To quantify this, consider an alternate universe in which the NBA adopted the NFL’s format for the regular season and playoffs. Neil Paine of Basketball Reference constructed an approximation of such an NBA season, aligning teams to match as closely as possible the NBA’s 30-team league with the NFL’s 32-team league. With 16 games to go around, there aren’t enough games for every team to play every other one, like in the NFL — so, for instance, the Lakers don’t play the Cleveland Cavaliers in this alternate reality. Then Paine simulated 10,000 such NBA seasons, using teams’ stats through last Tuesday’s games to estimate their strength and therefore their likelihood of winning each game. In these seasons, the usual suspects tend to finish on top. The Cavs win the “Super Bowl” 19.6% of the time, followed by the Lakers at 19.4% and the Celtics at 12.1%. The Hawks, Nuggets, Spurs, Jazz and Magic all also have at least a 6% chance of winning it all. However, some losing teams win in more than one of these simulated seasons, including the 76ers, the Clippers and the Kings. Before this NBA season, Paine ran similar simulations, using the actual NBA season structure, and found that the best team has about a 48% chance of winning the title. Playoffs aren't designed to figure out which team is the best. They're designed for drama, television ratings, and revenue. The only way for the best team to win the championship every year is to adopt the "everyone plays each other twice" system used by -- among others -- the English Premier League. It will never happen. Instead, fans in the States have always enjoyed playoff competition, and they're not at all concerned about proving who the absolute best team is. That's why college football gets so much crap from American sports fans, after all. Sitting in seventh place, and threatened with the prospect of being on the road for a WCHA playoff series for the second time in three years, the University of Minnesota is facing fan backlash against the hockey program. This isn't terribly new. Gopher Hockey is a huge entity in Minnesota, and when it isn't going well, fans don't react terribly well. They're used to winning. They're used to being at home in the WCHA playoffs. They're used to a team that pounds the daylights out of Minnesota teams like UMD, St. Cloud State, Minnesota State, and Bemidji State. This year, they haven't gotten that. Against the four Minnesota schools, the Gophers are just 2-6 this season. With the overall record sitting at just .500 (13-13-2), you can imagine the rumblings about head coach Don Lucia. Athletic director Joel Maturi spoke to our good friend and regular intermission guest Jess Myers, and he gave coach Don Lucia a vote of confidence. Listen. You're not going to find excuses for Gopher hockey shortcomings in this space. They're not nearly as good as they should be, and Lucia deserves at least some blame for it. However, this guy didn't win over 500 games and two national championships in college hockey by being a dummy. To suggest that the game has passed him by at age 51 is just silly. He's still sharp, still well-connected, and still knows how to win games. He also has a hella talented crop of players coming in next year, led by Blaine's Nick Bjugstad. We've heard about Gopher recruiting classes before, but this one seems like it has a ton of potential. Why the rush to throw out a proven winner? Oh, yeah. Dean Blais is back coaching college hockey, and it's not at Minnesota. Can't have that. In retrospect, Sunday wasn't the best day to virtually go into hiding. Instead of just letting the hockey world get by with one easy, news-free day, Toronto Maple Leafs general manager Brian Burke went crazy. Saddled with a low-rung team in the Eastern Conference, Burke -- who famously stated he "wouldn't watch this again" after Toronto finished 12th in the East last year -- saw enough of mediocrity, and he attacked this team's biggest weakness. In two moves, Burke performed a bigger shakeup than any we've seen on one day in the NHL in a long time, definitely since the salary cap came into play after the lockout. Joining him in the "Enough is enough" line was Calgary Flames general manager Darryl Sutter. Calgary trades defenseman Dion Phaneuf to Toronto in seven-player swap. It was the first major deal announced Sunday, and it's definitely the biggest. Burke saw enough of his team not being tough enough in their own zone, and he dealt away forwards he wasn't likely to bring back next season, anyway. Niklas Hagman and Matt Stajan are capable players, but they aren't superstars. It's clear that Burke thinks highly of youngster Tyler Bozak, and he already has his top scoring winger in Phil Kessel. Impending free agent defenseman Ian White joins Hagman and Stajan in Calgary, as does veteran forward Jamal Mayers, who wanted out anyway, and he played like it Saturday against Vancouver, lazily playing defense on Daniel Sedin while the latter scored the game-winning goal. While this looks like a good move for both teams, it's more intriguing for Calgary than it is good for Toronto. The move keeps the Flames positioned as a strong defensive team. As Bob McKenzie notes, White is no slouch, even if he's not necessarily as well-known as Phaneuf. With that said, White is a free agent (restricted) after the season, so it's not a total lock he'll be back. Stajan and Hagman upgrade the offense, giving them more depth across their lines, something they haven't had much of. It doesn't help them at all that Olli Jokinen hasn't fulfilled his potential there, and they haven't found anyone to center Jarome Iginla the way Mike Cammalleri did last year. However, is this a move that sets up something potentially (much) bigger? Last week, McKenzie noted that Calgary was potentially interested in Ilya Kovalchuk, a free-agent-to-be superstar in Atlanta. The Thrashers are trying desperately to re-sign Kovalchuk, but let's not be stupid. This is a long shot. It could be said he belongs somewhere that will take hockey seriously, instead of playing in front of third-full buildings (if that) in Atlanta. Of course, the Thrashers are improving, and they need Kovalchuk to be a part of the effort to make this franchise viable. Either way, Atlanta has to trade him by March 3 if they can't re-sign him. It's either that or let his negotiating rights go for a draft pick after the Stanley Cup Finals. This is a much more attractive option, because it gives them a chance to pick up some talent in return. Now, Calgary has some assets they could afford to flip for Kovalchuk, should they choose to be aggressive. The beauty of this is that Sutter can wait through nearly two more weeks of games to see how the new guys come along, and he can play around with numbers and trade possibilities during the two-week Olympic break before he has to make a decision. Chances are Atlanta would want NHL-level players, a top prospect, and/or a draft pick for Kovalchuk. The draft pick is less valuable because you're dealing Kovalchuk to a contender, so the pick is in the bottom third of the first round. Instead, Atlanta is better off taking players, even if they're guys like White and Dustin Boyd, who are RFAs after the season. You could envision the Flames flipping Hagman, who has two reasonably-priced years left on his deal, or Stajan, who would be reunited with former Leaf mates Nik Antropov and Pavel Kubina in Atlanta. You can't replace guys like Kovalchuk, but the Thrashers have to get NHL value for him, as they are still in the thick of the East playoff race. With the break coming, it's unlikely Atlanta will fall off the map before the trade deadline. Burke gets his big, bruising defenseman who has a big name. Phaneuf upgrades a bad defensive team, and he also brings the kind of edge that Burke loves. One thing that is driving Burke nuts is how easily his team gets pushed around, and he's been trying to change that for a while. The Mike Komisarek signing backfired because of injury, and holdover Jeff Finger hasn't been very good this year. Short-term, the Leafs win. They make a big splash when Burke needed to shake things up, and he gets a long-term solution in Phaneuf -- who's only 24, by the way -- in exchange for three impending free agents and Hagman. Oh, and Burke also got the best young player in the deal, because he wrestled prospect defenseman Keith Aulie from the Flames, too. Sutter's team was short on scoring and depth, and he actually looks like the more desperate guy in the deal, giving up two big young blue-liners for a guys who might not be around past this spring. Anaheim swaps Jean-Sebastien Giguere for Jason Blake and Vesa Toskala from Toronto. This is much simpler. Giguere needs to get his mojo back if he is ever going to come close to justifying his huge contract. This move reunites him with Burke and Francois Allaire, Giguere's longtime goaltending coach. He wasn't going to play much in Anaheim, as the Ducks had just made a four-year, multi-million dollar deal with Jonas Hiller. He is their guy moving forward, and Giguere had to go. Burke, meanwhile, was tired of watching Toskala look fantastic one night and incompetent the next. Now, youngster Jonas Gustavsson gets a high-quality on-ice mentor in Giguere, and the Leafs get a guy who is actually capable of being a No. 1 goaltender. This is a no-lose for both sides. Blake wasn't exactly lighting it up in Toronto, with ten goals and 26 points in 56 games. Now he gets a change of scenery, and he joins a forward group in Anaheim that includes tough veterans like Saku Koivu and Teemu Selanne. The Ducks get future cap flexibility, and they rid themselves of a $7 million backup goalie. Good deal for them. Having to take on Toskala's salary is a small price for shipping Giguere north. It was a big Sunday for the Maple Leafs, who might be in last place in the Eastern Conference, but they're still not dead, and now they get a chance to prove that. One thing is certain: If they continue to play like they've been, Burke will find more deals to make before the March 3 deadline. He's not really good at "standing pat" or "being patient."